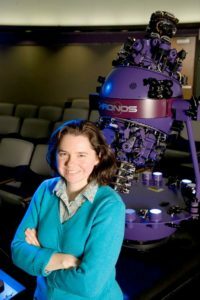 Marietta College’s Anderson Hancock Planetarium features monthly public shows at varying times and dates. The public shows are free, though donations to help pay for future programming will be accepted. Reinvigorate your fascination with the night sky and gain a better understanding of the relative size and movements of the countless heavenly bodies that make up the Universe at Marietta College’s Anderson Hancock Planetarium. Featured prominently on Marietta College’s historic campus, the 4,400-square-foot planetarium adjoins the Rickey Science Center and is located at the corner of Fourth and Butler streets. The facility is handicapped accessible and includes theater-style seating for 102 people. 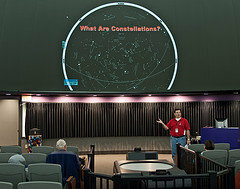 Named after Emeritus Professors Dr. Les Anderson ’55 and Dr. Whit Hancock, the planetarium is equipped with a hybrid projection system that combines an optical-mechanical star projector with a powerful full-dome digital video projector. 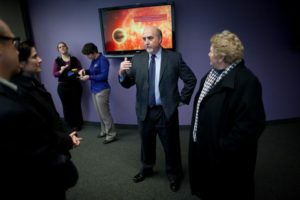 Marietta College is currently one of a handful of planetariums in the country to feature the Goto Chronos hybrid system, which can replicate the night sky from thousands of years in the past to thousands of years in the future from countless vantage points in the Universe. 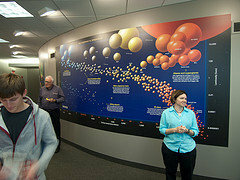 The lobby also features quiet study areas and current science programming from NASA’s ViewSpace data/video feed.